Is anyone else listening and as obsessed as I am with the Hamilton cast recording? I can't seem to stop listening. I was in NY for a super quick trip in August and thought about trying to get tickets, but I think it was the week it opened and I didn't think I stood a chance. Now I'm super bummed that I didn't at least try. I think I might have to try to make it happen at some point though! I am completely obsessed with it. I saw the show in July (third day of previews; bought the tickets the day they went on sale in March; planned the whole trip to NY around the tickets). It is amazing and lives up to every bit of the hype. I have been waiting for the cast recording ever since. Now I can't stop listening to it and the songs are on permanent repeat in my head! I can't remember the last time I was so obsessed with anything, actually. I just listened to this for the first time today. Slowly becoming obsessed! This is one of the best cast recordings and Broadway soundtracks I have heard in ages! I love that it includes the whole show (I think there is one scene missing from the recording), so it really is the next best thing to being there (especially if you read along with the lyrics which makes it easy to follow). I'm a little biased, knowing people involved with the show, but, and I've said this here before, it's the show of the decade. That's all there is to it. Those six years of work Lin and Tommy put into the show have paid off in spades. And the cast is exquisite. Leslie Odom, finally gets the role his talent deserves. Listen to Room where it Happens and tell me that Tony award isn't in the bag. But really, Daveed Diggs (in Guns & Ships tho!! ), Phillipa Soo, Renee Elise Goldsberry are all amazing too and I love the Jon Groff's bits, hilarious. It's a pretty flawless score but I think Satisfied might be one of the best musical theatre songs written, just ever. I love Room where it Happens, Ten Duel Commandments,Dear Theodosia and Burn. And on stage, It's Quiet Uptown basically destroys me every time I see it. I'm a puddle by the end. I've seen it seven times now, but I'd say to anyone, if the opportunity to see comes your way, grab it. I would think things will settle down ticket wise after Christmas, so try and get in post new year, pre Tonys in June. I love the music & what I've seen in clips. If I hadn't committed to a friend to go to London and/or Edinburgh this year, I'd be going to NYC just see Hamilton. I'm pretty sad that the money won't stretch that far. 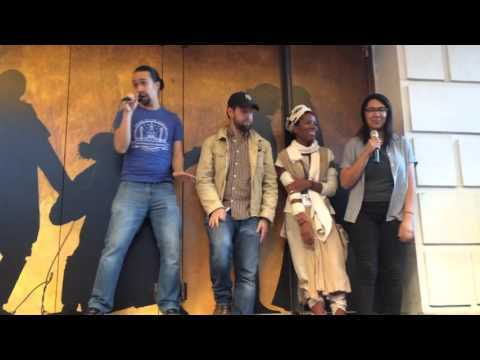 I just posted over in the broadwau musical thread about my current Hamilton related obsession-- the Ham4Ham shows. Since I can't get to NY to see the show again anytime soon, i get my fix from the cast recording and these you tube videos. 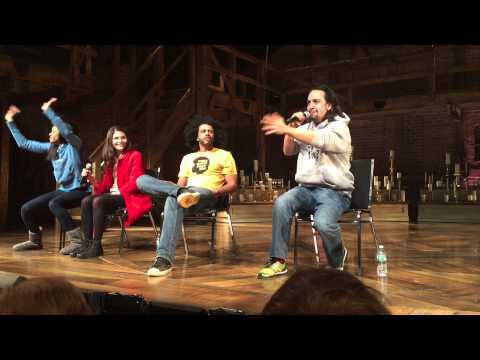 There was a great Guns and Ships singalong a couple of weeks ago (with one participant in her ComicCon garb an another participant from the Les Miz cast) and one where Lin and Daveed Diggs did the cabinet battle but switched roles. @Scarlett you've seen it SEVEN times?! I don't think I can adequately express my jealousy. One of my best girlfriends and I are tentatively planning a NY trip mostly just to see it, and I looked at tickets the other day out of curiosity. At least into March/April the tickets are limited (meaning upwards of $200-300). I'll get there eventually, but I'm going to have to spend a pretty penny to get there. Until then the recording and Ham4Ham videos will have to suffice. I have between the early performances at The Public and then after the move to Broadway. I'd say try and see it with the original cast if you can, it's a really special mix of people. @Scarlett that's definitely the goal! I read someplace that the original cast are all on one year contracts, but I can't remember where I saw that and don't know what is standard. @Scarlett, i must have watched that four times before i went to bed last night. The is another short snippet of it on twitter where you can more clearly see Leslie Odom and Daveed Diggs do their walk by, which was a nice touch. I am thoroughly obssesed. If I'm not listening to the recording I'm probably singing pieces in my head. @Scarlett JAW ON FLOOR. SO JEALOUS. CAN YOU TELL BY THE ALL CAPS?! I have my ticket for January and I am (obviously) extremely pumped. Every time I listen to it I get new feels or hear a new twist on something. Right now I'm trying to get the lyrics of Satisfied down and I'm getting close(r). I think one of my favorite parts is in Meet Me Inside where Hamilton cracks with "Call me son one more time!" I get chills every single time. That Ham4Ham was so awesome. @karenFK you and I are on the same wavelength as I watched it a few times in a row the other night. I just got my cd set in the mail last night! So happy. Also, if any of you are also Parks and Rec fans, you NEED to check out #ParksandHam on twitter- especially posts by @emilyisanelf. Probably the best thing I've seen lately. Oh and he was on Jimmy Fallon the other night too, if someone wants to search out those vids on Youtube! I never watch 60 minutes and actually tuned in to watch it live last night. Such is the power of my Hamilton obsession. Of the ones they didn't broadcast, I particularly liked the one about recording the cast album. And I was able to get a ticket to see it again in April. Am hoping I won't disturb anyone around me by singing along. Granted, I just finished a production of Fiddler on the Roof so I was especially tickled, but no matter what this is so incredibly adorable!! Oh the wedding vid is legendary amongst us theatre nerds (we were also the only ones who watched Do No Harm when it aired because it has three Bwy heavy hitters in Steve Pasquale, Lin & Michael Esper). But you'll notice Tommy Kail (Hamiltons director) Chris Jackson (George Washington) amd Javilton up there in that wedding vid too, which just goes to show how much of a close knit affair Hamilton is. I love that vid, it's genius tho. @KarenFK dittos with me and 60 minutes. I'm pretty sure that was the first time I ever watched the program. Here is a great interview with the alternate Hamilton, Javier Munoz. Here is another excellent article from the Smithsonian magazine. On the Colbert Show last night, Sir Andrew Lloyd Weber was asked by Colbert "is there any show out there that you wished you had written?" (something like that) and with out skipping a beat, he said "Hamilton"
Here is a great article about the Ham4Ham shows from Slate. I love that Ham4Ham has taken off the way it has and people get excited about it. It's a very clever thing Lin's done. I was on the show's website (something I do far too often) and I noticed they've already begun auditions for both the NYC show and the national tour! I may actually have a chance to see the show now! I am ravenous for all things Hamilton. There has been talk of a transfer to the West End too.